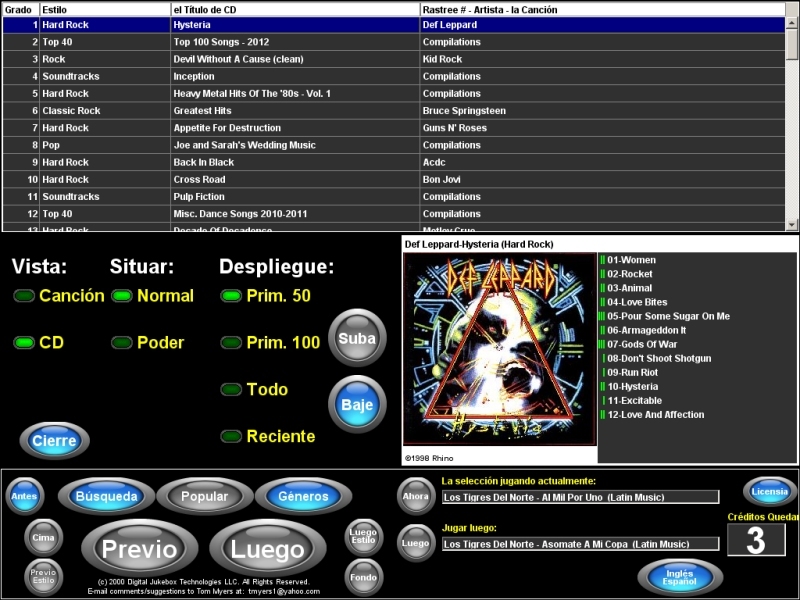 The Main screen looks and feels like a regular CD jukebox, where you view "pages" of 4 CDs at a time. 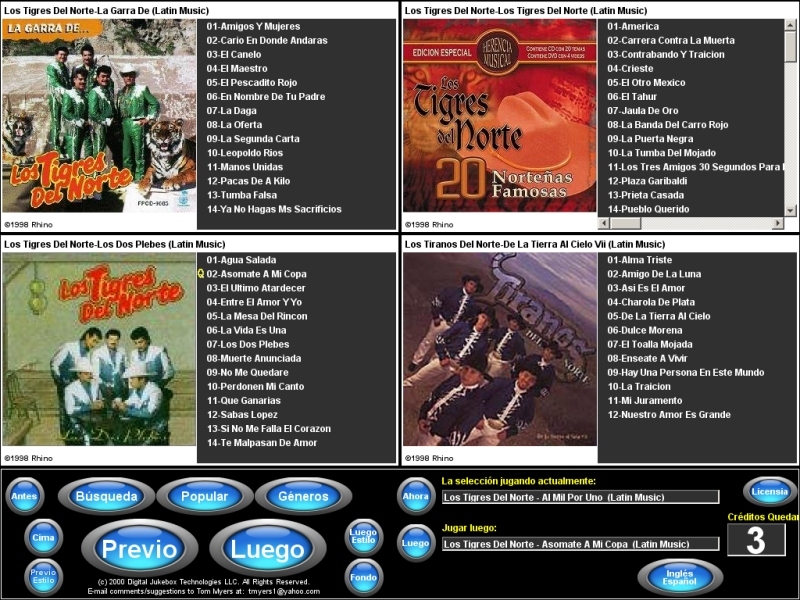 Each CD panel has the CD number, title, artist, genre at the top, the cover art to the left, and the song listings to the right. You can see which songs are the most popular by the green bars next to the song name, with the most played songs having up to 3 green bars. 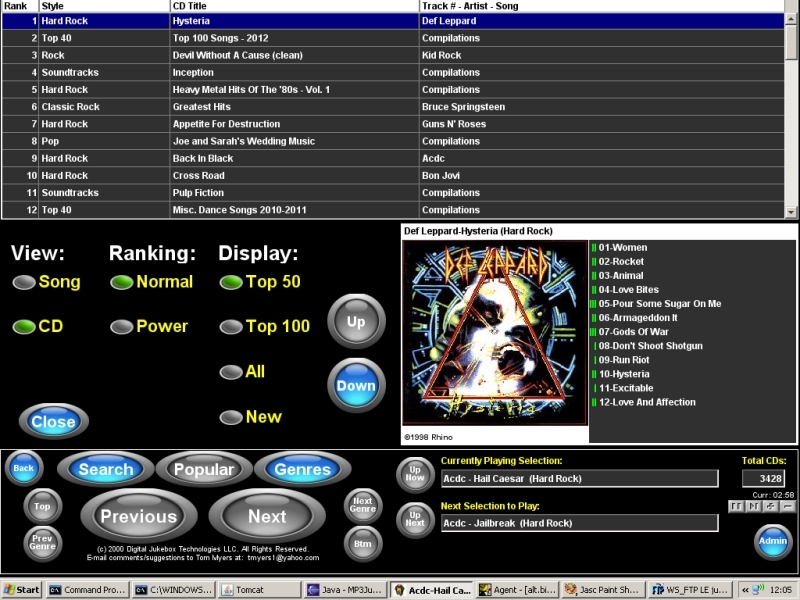 This takes the guesswork out of picking a song from particular CD where you don't know the song names. 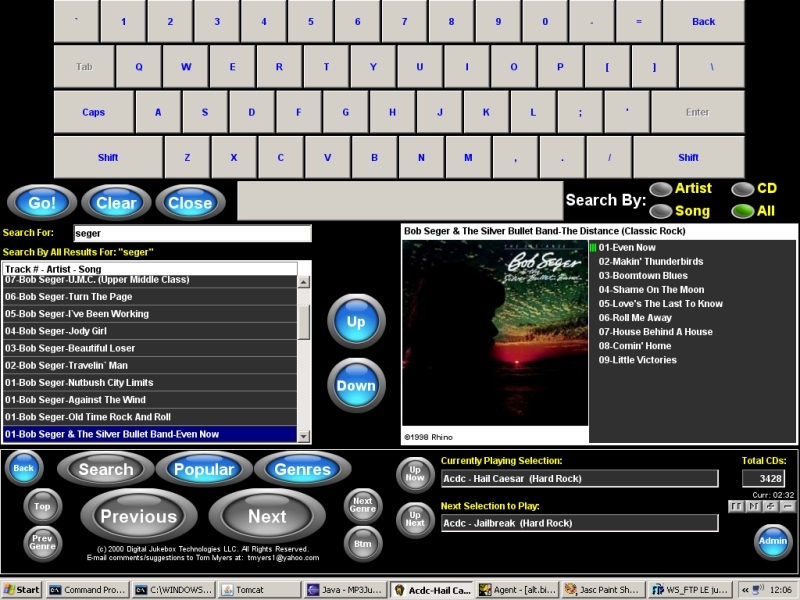 The Search screen allows you to search for either songs, artist, CD titles or everything based upon the key words you enter. JukeANator will perform partial word matching to ensure that even if you spell a word wrong, you will still find what you are looking for. Using the "Back" button on the control panel, you can even go back to prior searches. 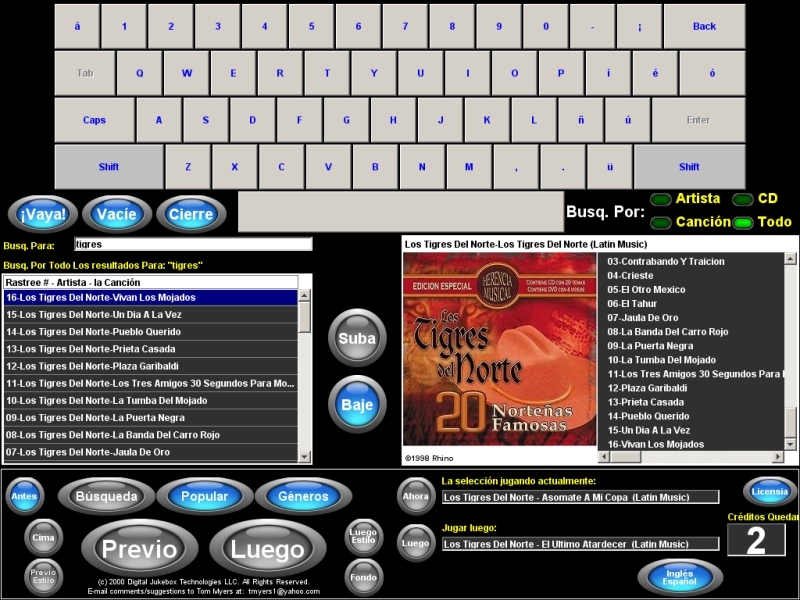 The reason why you see an on-screen keyboard is that JukeANator can be used without a keyboard and mouse using just a touch-screen. 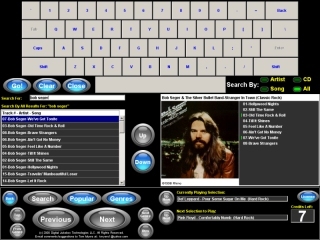 This feature is necessary for the commercial version that is housed in a custom cabinet in a bar or pool hall, and comes in very handy at a party in "kiosk" mode where you want guests to interact with the jukebox, but don't want them to access the rest of your computer. 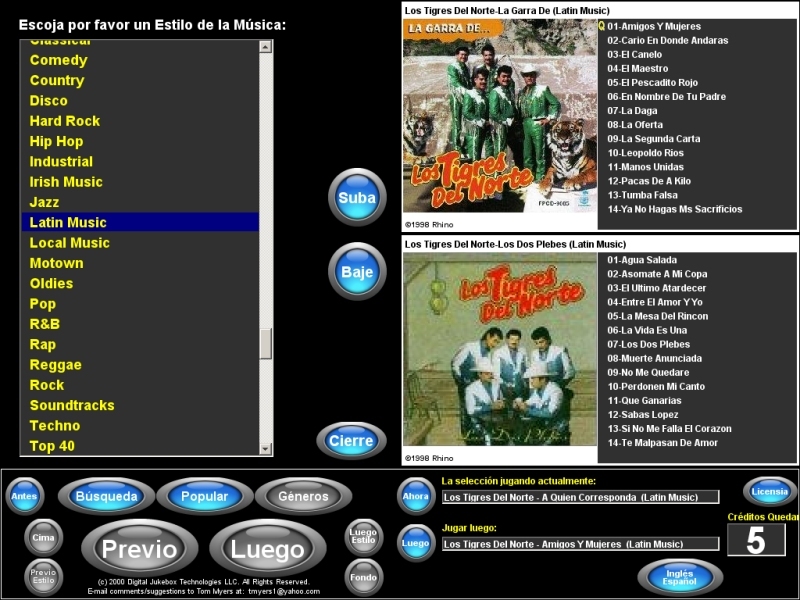 The Popular screen goes beyond what you find in most other jukeboxes... 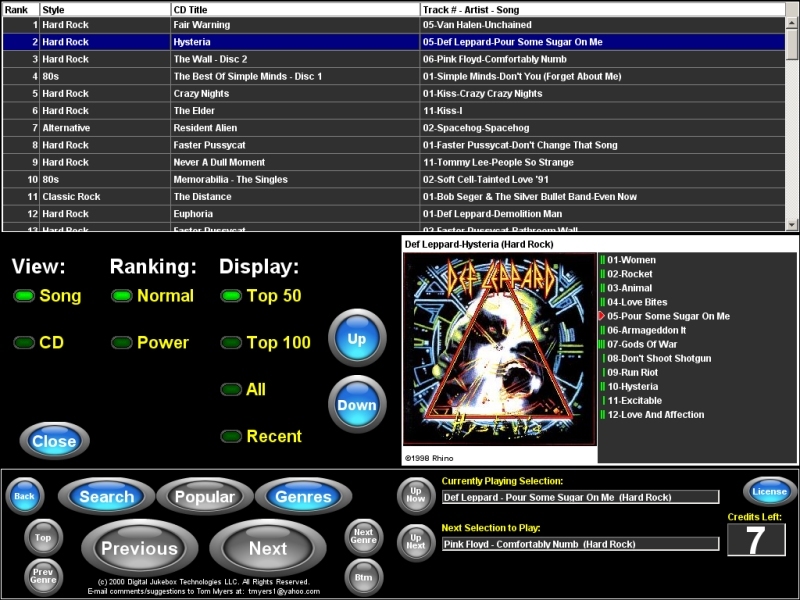 Here, you can view the most played individual songs or entire CDs with the most collective plays... You can even view "power" rankings in which songs or CDs with the most plays in the fewest amount of days are shown at the top... You can view either the top 50, top 100 or top 500 for either songs or CDs. A unique feature of JukeANator is the "recent" display. 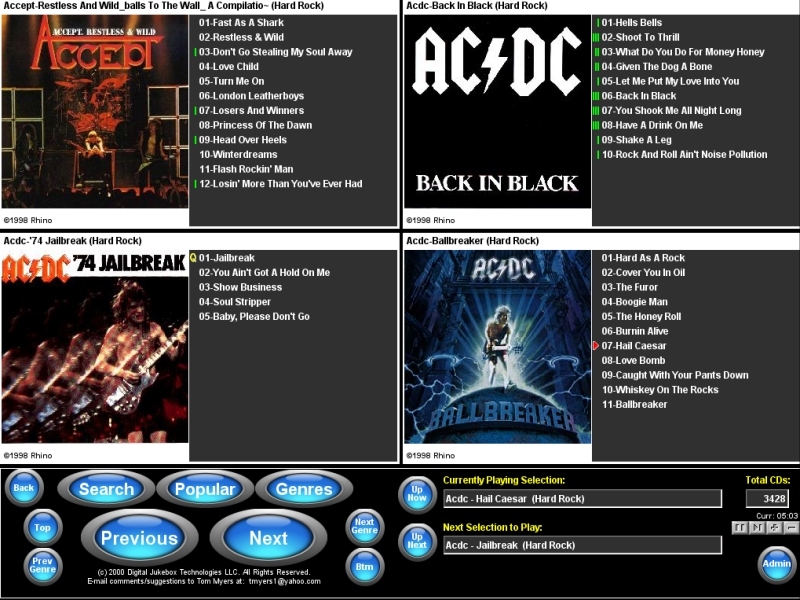 If the "view" is set to "CD", then you will actually be looking at the newest CDs that have been added to the jukebox. You will see a visual cue to this because new CDs will have a red border. This comes in handy if you want to see what is new but don't want to have to peruse everything in order to find out. 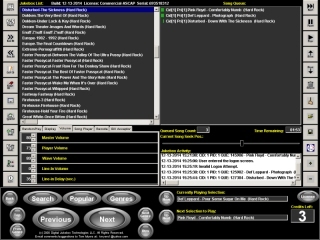 If the "view" is set to song, then you will see a listing of all the most recently played songs. This comes in handy when you hear a song that you like (that maybe someone else played or was played at random), but didn't know which CD the song was from or what the song name was. 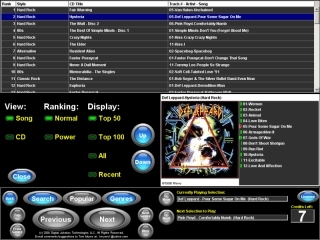 The Admin screen shows the contents of the song queue, in other words, the list of songs that are going to be played, as well as many buttons for pausing the currently playing song, rejecting the currently playing song, playing the selected queued song, removing selected queued songs, moving selected queued songs up/down in the queue, loading songs from a playlist into the queue and saving the queue as a playlist. 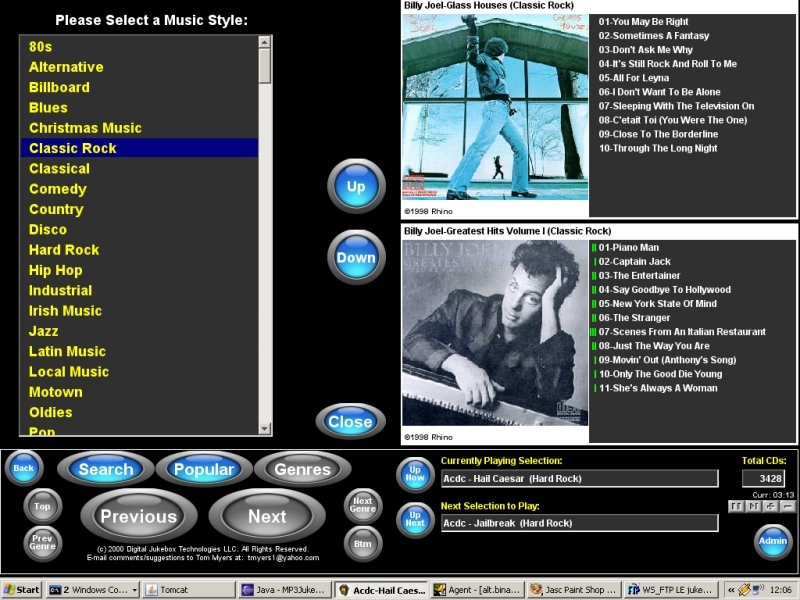 In addition, the configuration tabs for the jukebox are on the Admin screen. 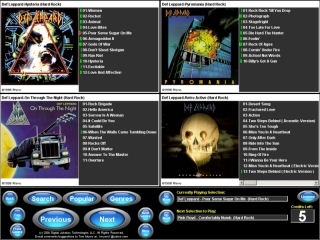 You can adjust the random play features, such as how many random songs to have in the queue at all times, whether or not to play songs randomly from a particular style of music or whether or not to play entire CDs randomly. 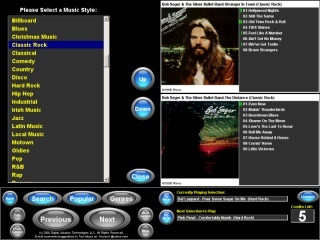 You can also decide whether or not to allow songs with explicit lyrics to be played, whether or not to operate the jukebox in "kiosk" mode, whether or not to use a screen saver, whether or not to use confirmation dialogs. You can adjust the volume of the song player, decide which song player to use, either VLC Media Player, Winamp, Windows Media Player, Quicktime Player or native Java (with Java Media Framework). This allows you to play protected song formats as WMA and iTunes AAC. 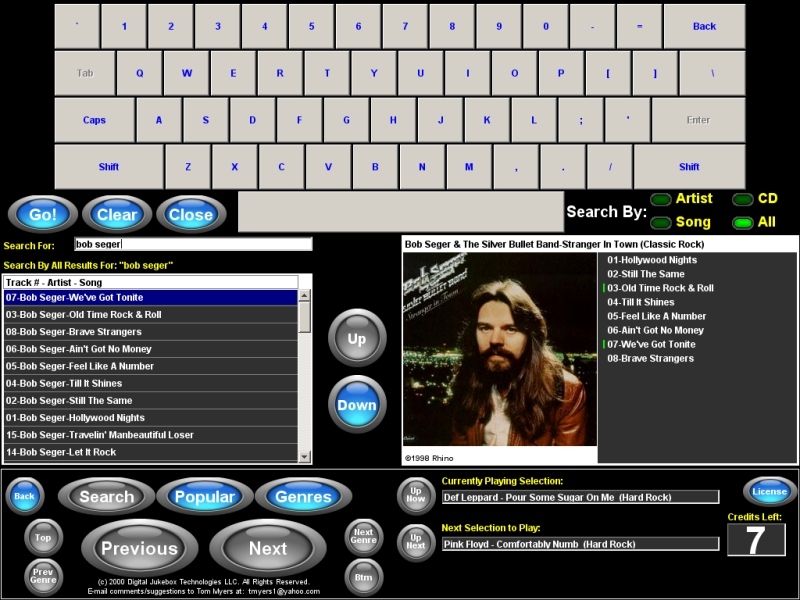 Lastly, there are buttons for modifying the contents of the jukebox library itself. You can rescan your hard drive for new songs, reset the random play and user-selected song usage statistics, edit the metadata for a CD (such as publisher, copyright info and whether or not the CD contains explicit lyrics). You can also view screens to show you any duplicate songs that are in the jukebox, as well as screens to show you the least popular songs and CDs. You can choose to either delete CD contents or ignore them. For example, if you are a commercial customer, you may wish to ignore Christmas Music related CDs when it isn't the holiday season. The admin screen is easily accessible from the Main screen when in non-commercial mode (by clicking on the "Admin" button), otherwise when in a bar/pool hall/etc., this screen is password protected.